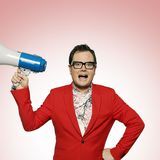 The 'Chatty Man' himself, Alan Carr, brings his first stand up show for four years to Birmingham Hippodrome this September. After years of watching Alan on the television, it's easy to forget that he started his entertainment career as a stand-up comedian in Manchester. In fact, Alan has an authentic comedy pedigree. He launched his career back in 2001 by winning the BBC New Comedy Award and has won two British Comedy Awards since. Although also successful as an author and radio host, Alan is best known for his television work. After hosting 'The Friday Night Project' with Justin Lee Collins, Alan was given his own show 'Alan Carr: Chatty Man', which has been airing on Channel 4 since 2009. Yap, Yap, Yap!' is sure to be full of Alan's trademark catty, flamboyant and warm-hearted observational humour.